Are you ready for the 101 WKQX Piqniq?? That’s right, the yearly one-day festival is back, and headlining this year’s show is Awolnation!! They’re performing along with Dashboard Confessional, Bush, The Neighbourhood, and much, much more with further artists still to be announced – it’s all happening at the Hollywood Casino Ampitheatre on Saturday 30th June 2018!! Don’t miss out on your chance to be part of it all – grab your tickets today!! 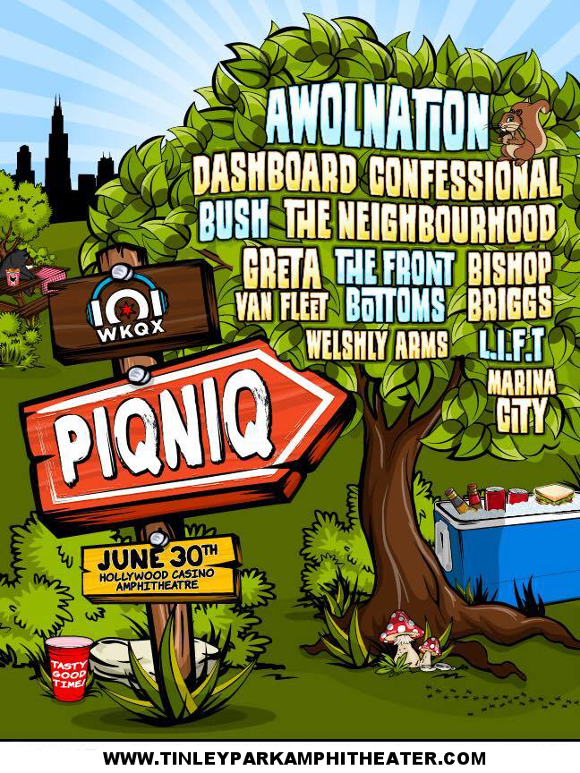 The current confirmed lineup for this year’s 101 WKQX Piqniq is AWOLNATION, The Neighbourhood, Bush, Dashboard Confessional, The Front Bottoms, Bishop Briggs, Greta Van Fleet, Welshly Arms, and L.I.F.T. The headliner, electronic rock group Awolnation will be a huge draw for many. Breaking through to a massive audience with the release of their debut album, “Megalithic Symphony,” the incredibly distinctive song “Sail,” amassed over 135,000,000 views on YouTube, hit number 10 on the US Billboard Rock Songs chart and achieved Platinum status in the US and 6-times Platinum in Canada! Get ready to experience it all live – grab your tickets for the 101 WKQX Piqniq TODAY! !